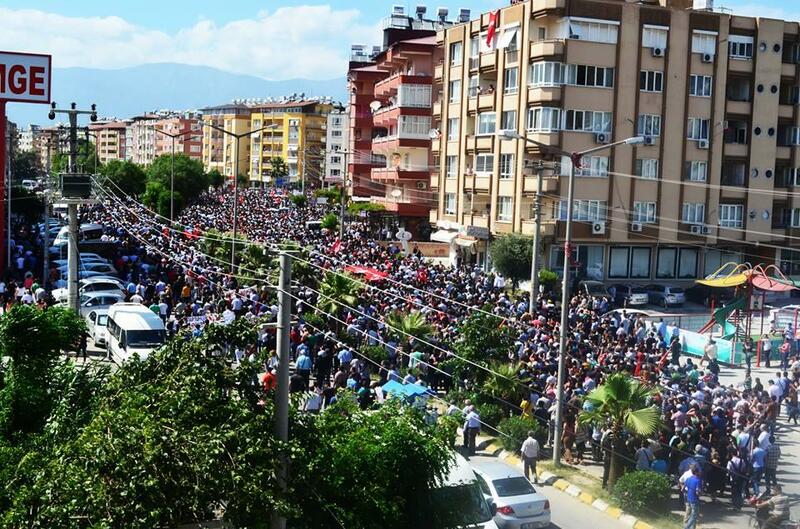 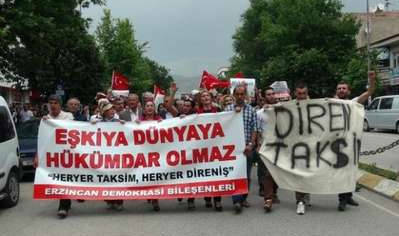 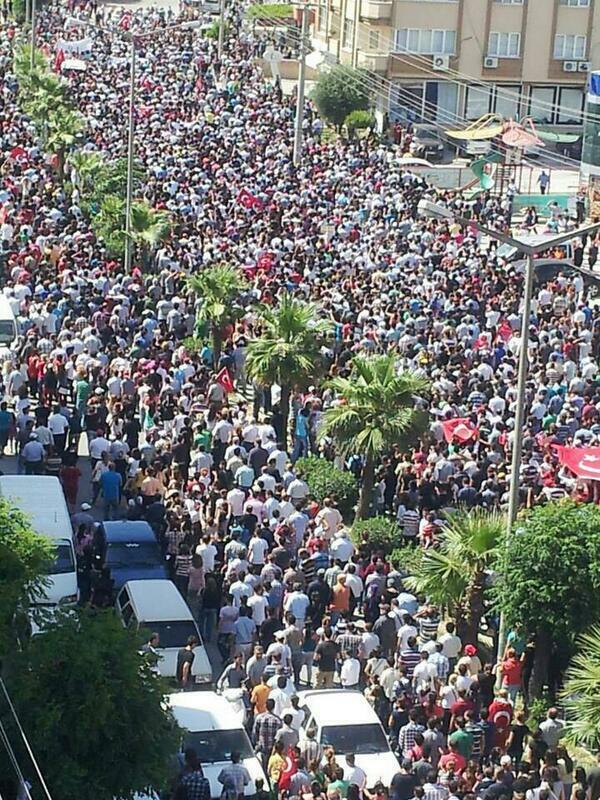 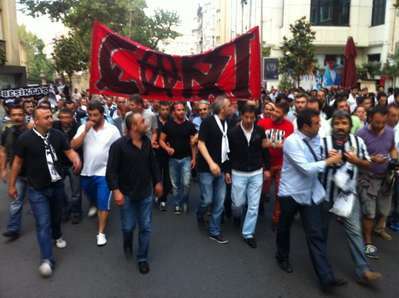 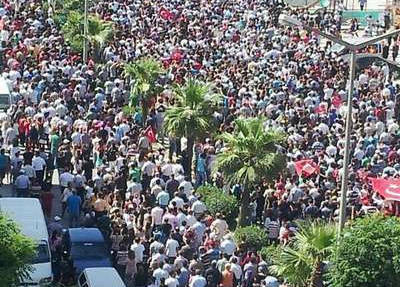 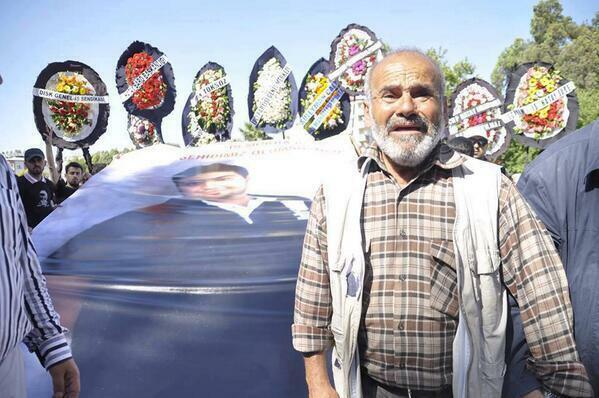 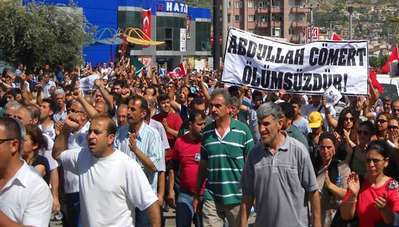 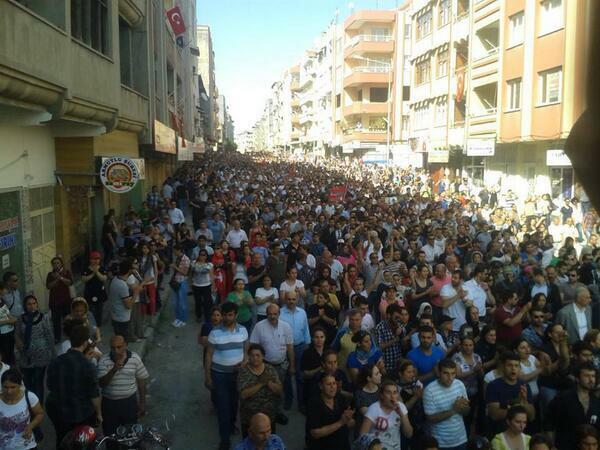 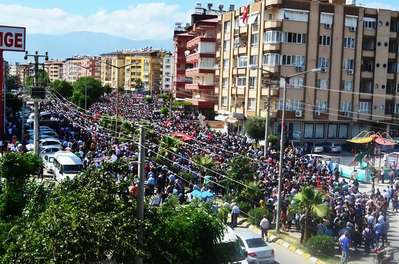 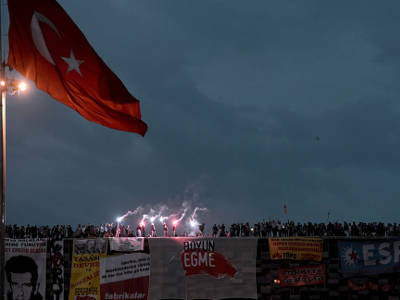 Funeral of Abdullah Cömert (22) held with thousands of attendees in Hatay, Turkey. 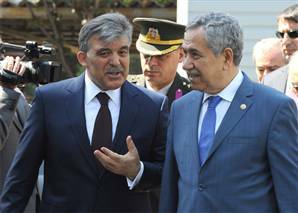 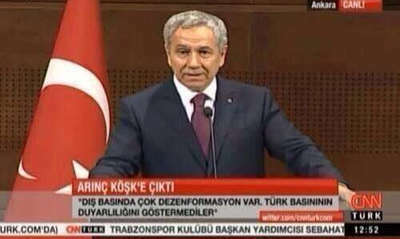 Vice Prime Minister Bülent Arınç had a meeting with the President Abdullah Gül, then announced that the negotiations is expected to begin with the protestors tomorrow. 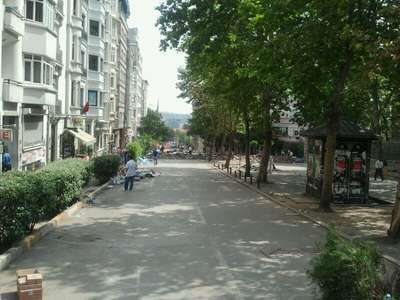 Taksim was peaceful during the whole day. 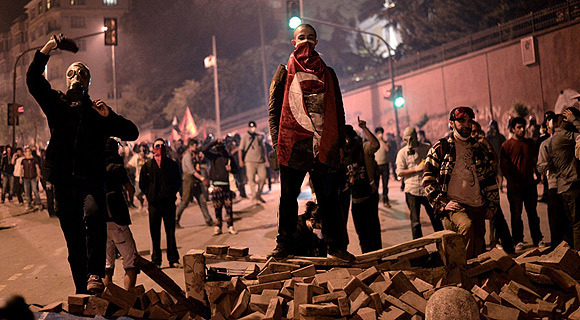 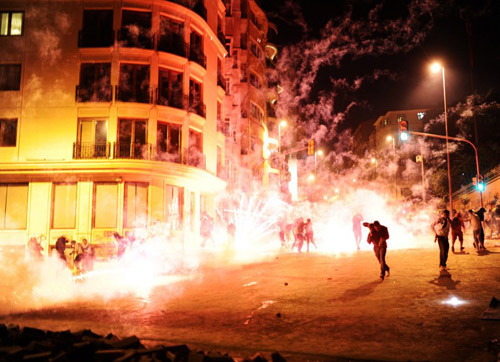 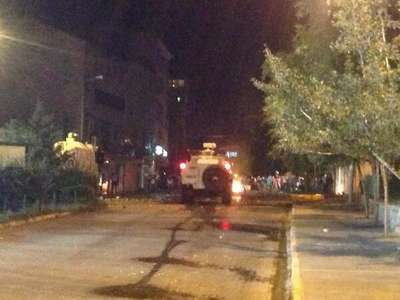 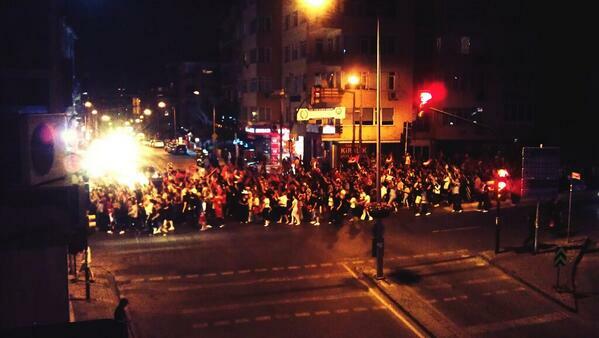 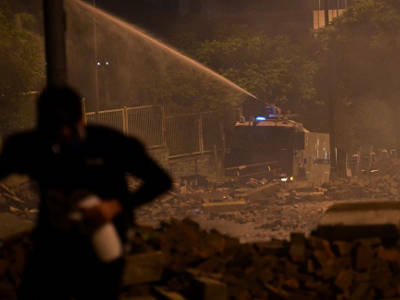 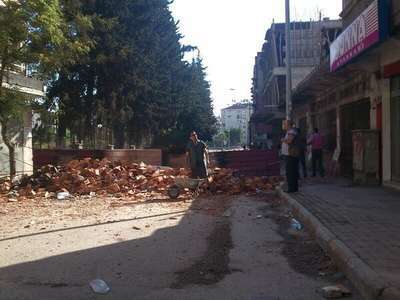 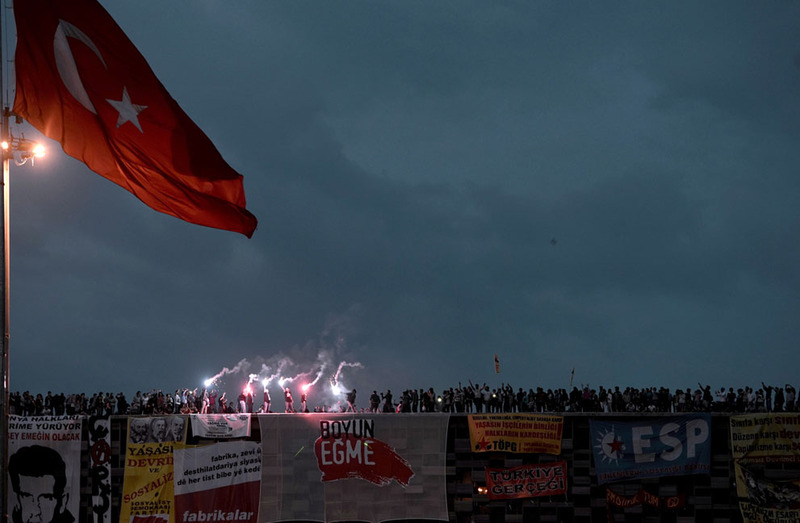 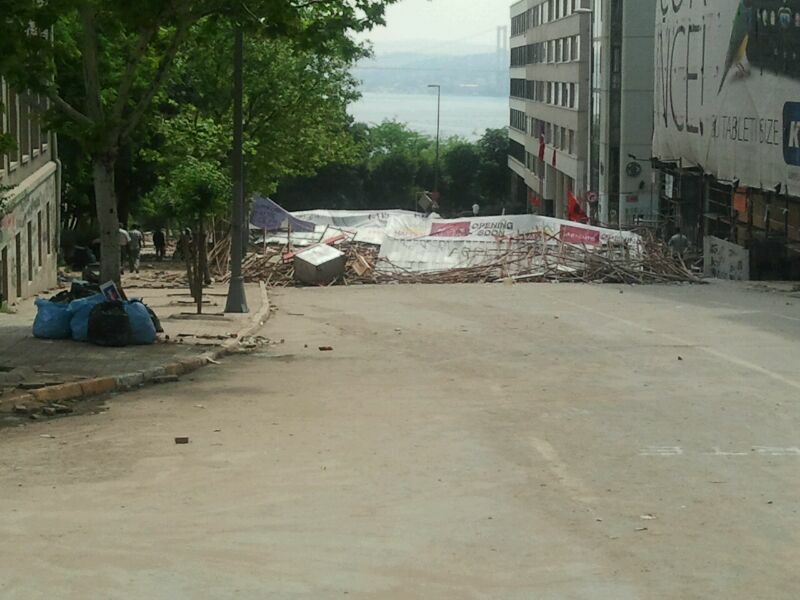 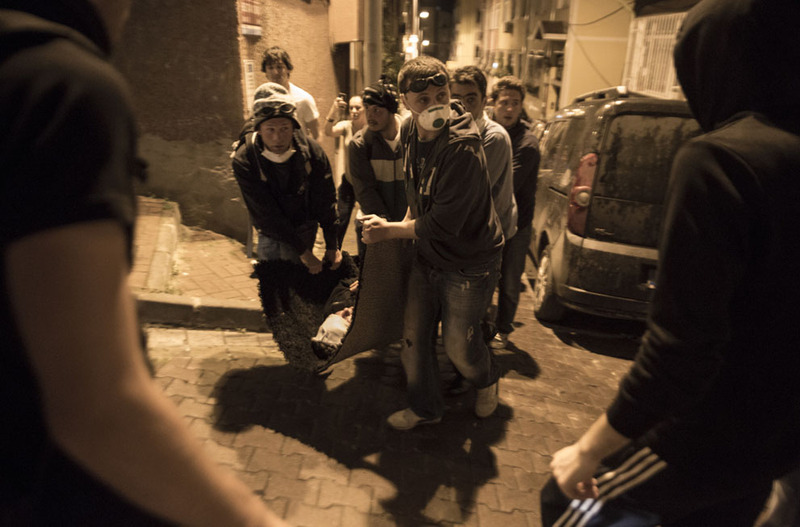 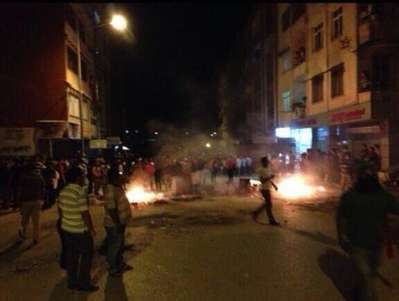 However, the clashes kept going in Beşiktaş and severely proliferated in Tunceli and Antakya at the night. 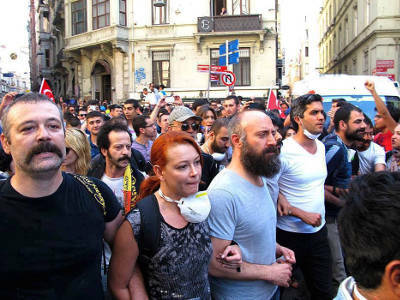 Artists protesting together on İstiklal street, İstanbul. 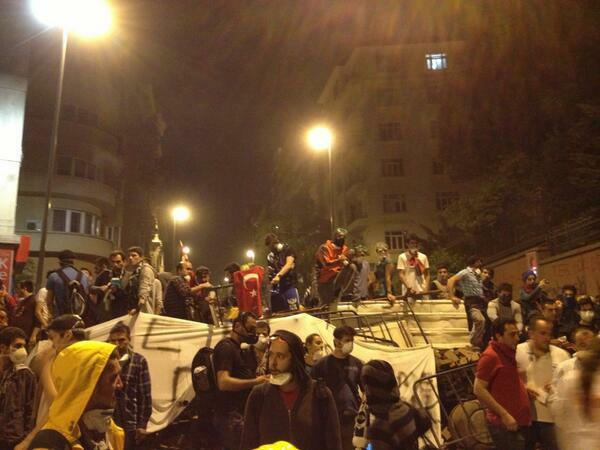 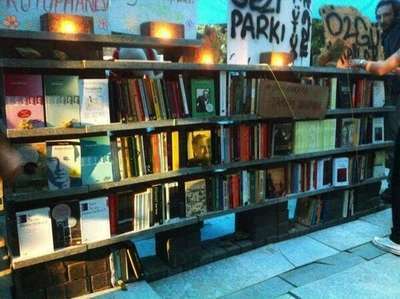 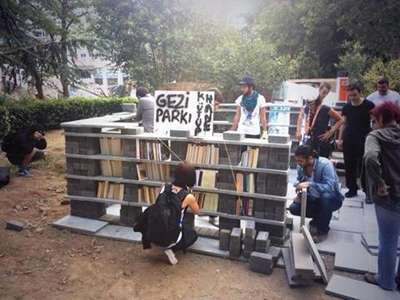 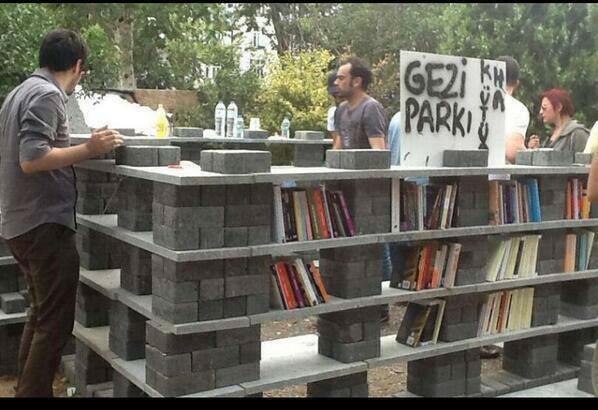 A library built by the protesters in Taksim, İstanbul. 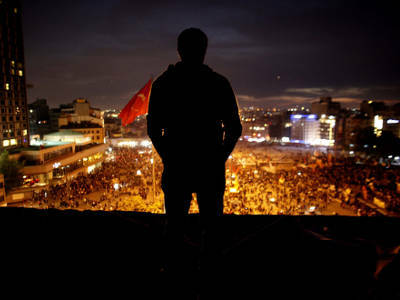 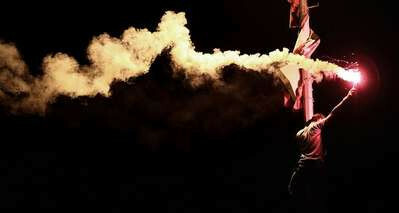 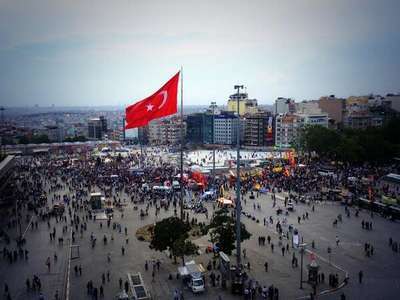 Turkish pop singer Tarkan in Taksim, İstanbul. Sermiyan Midyat protesting CNN Türk TV channel on a live CNN Türk interview in Taksim, İstanbul. 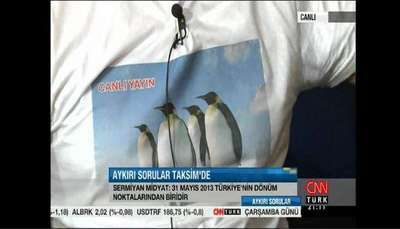 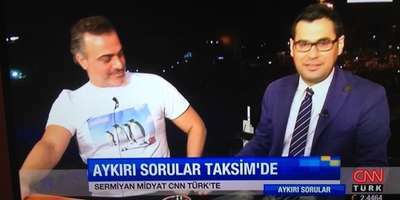 The t-shirt he wears was refering to the documentary of penguins broadcasted during the early day of the protests on CNN Türk. 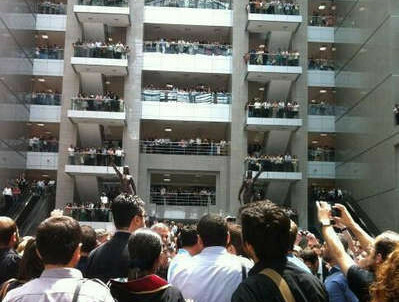 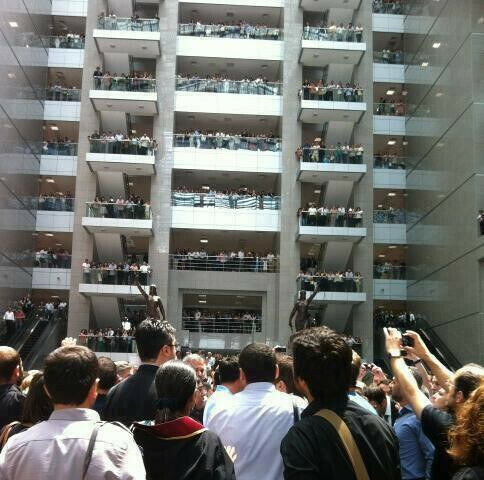 Lawyers supporting the ongoing protests in Çağlayan Courthouse, İstanbul. 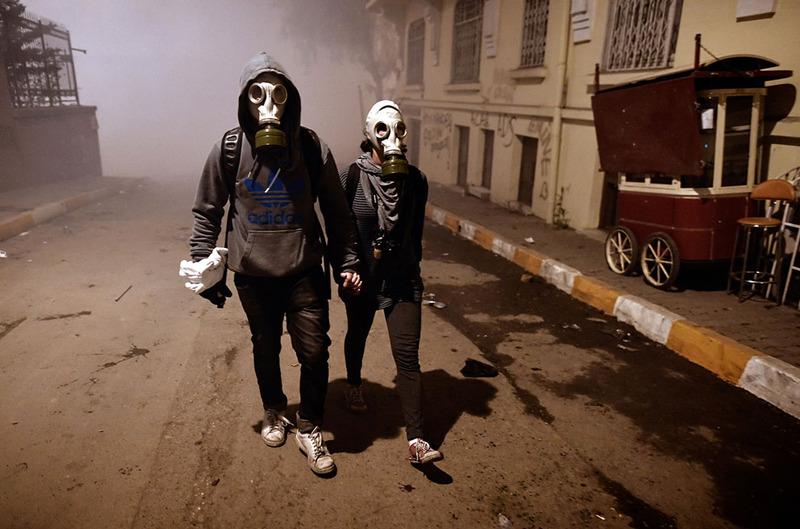 "You look so lovely when you resist." 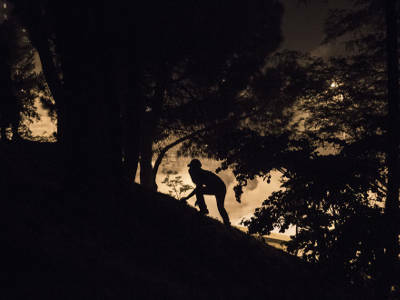 "It smells so damn free." "Now there is a trouble called Twitter filled with lies. 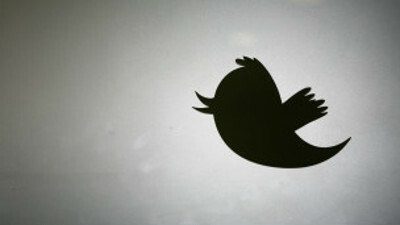 The thing called social media is the main problem of today's societies." The thing called social media is the main problem of today's societies. 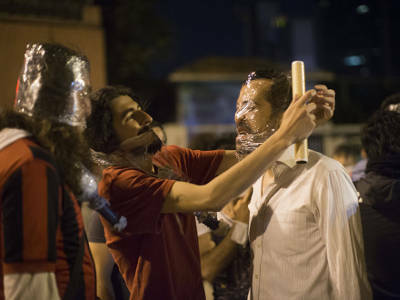 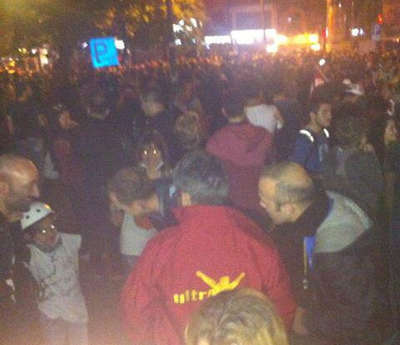 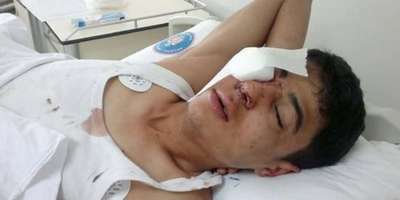 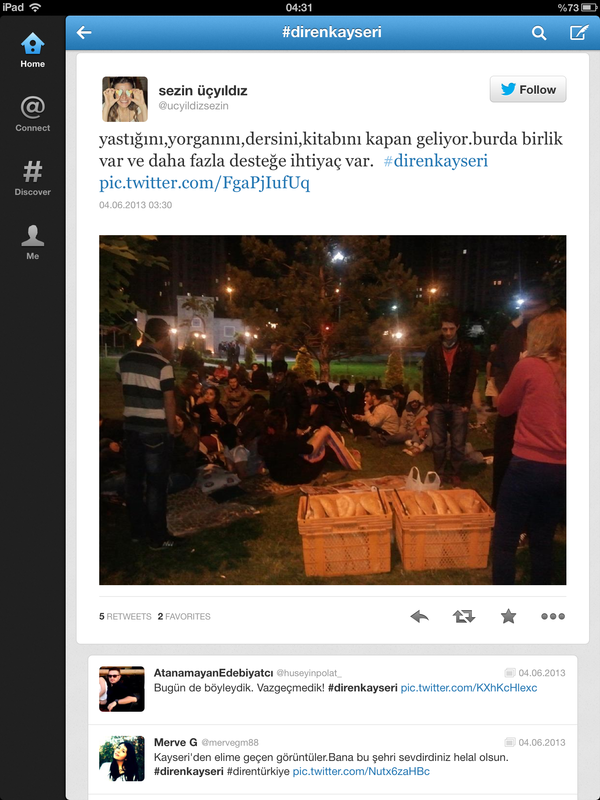 "In response to Şamil Tayyar's live statement saying that "Protesters trying to uncover the scarfes of religious women. 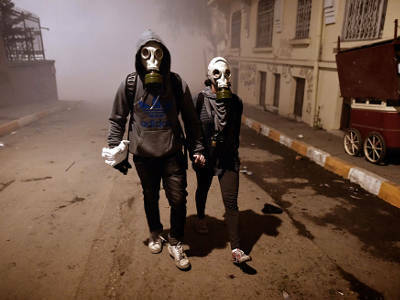 What kind of a freedom is that? 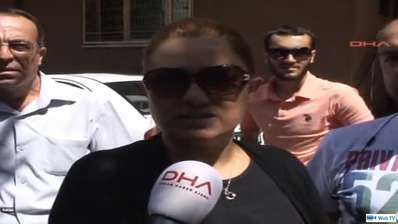 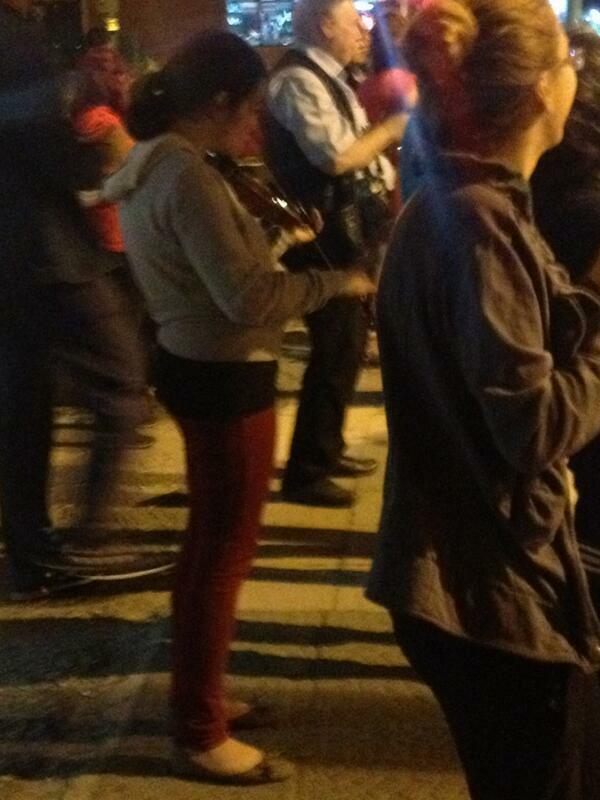 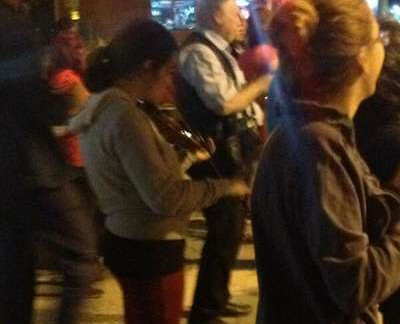 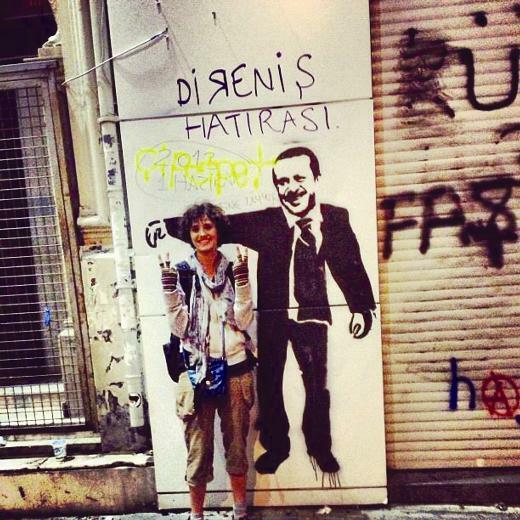 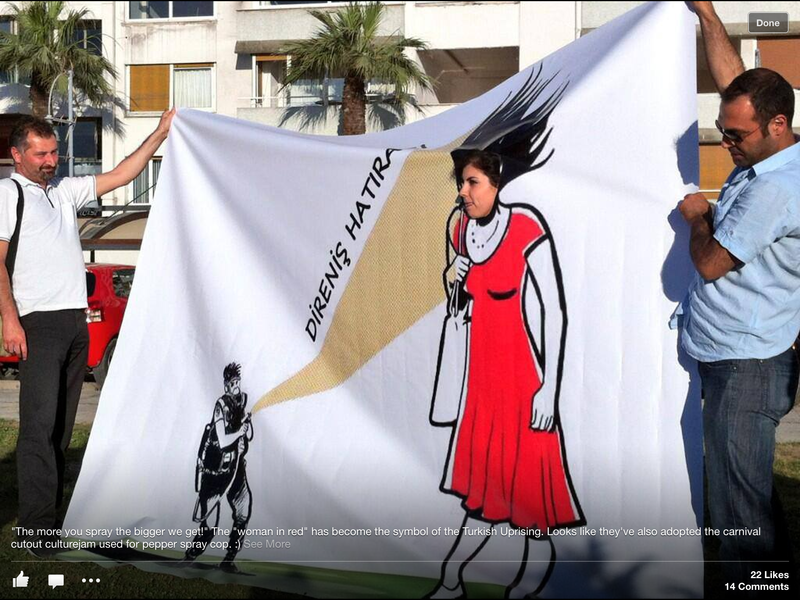 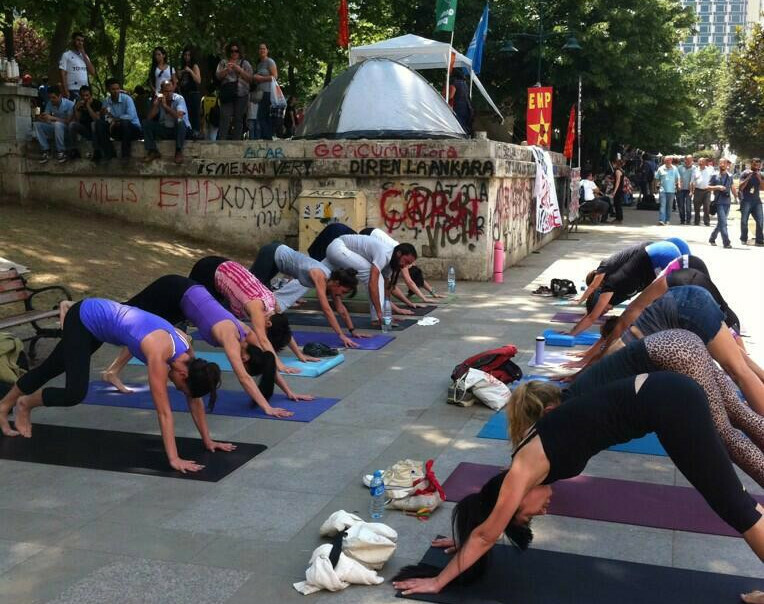 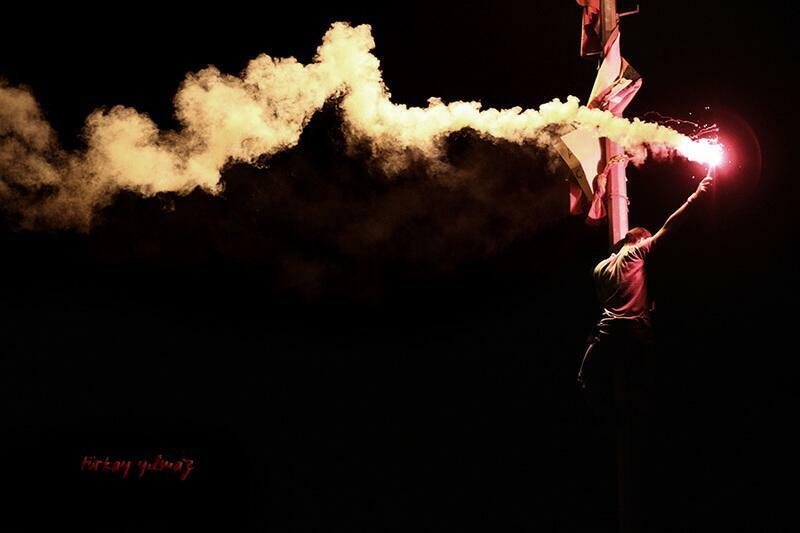 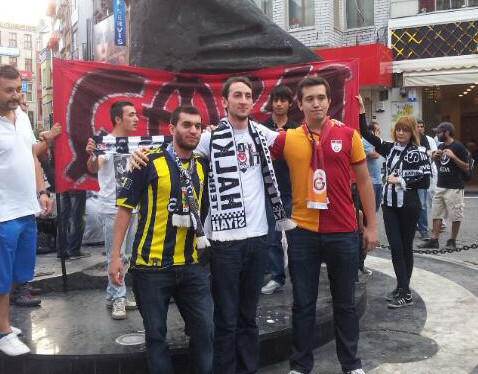 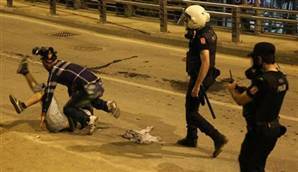 ", the woman on Twitter replies that "I was in Taksim with my scarf. 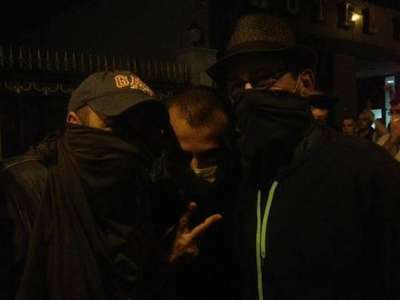 Protesters protected me instead of bullying. Stop lying! 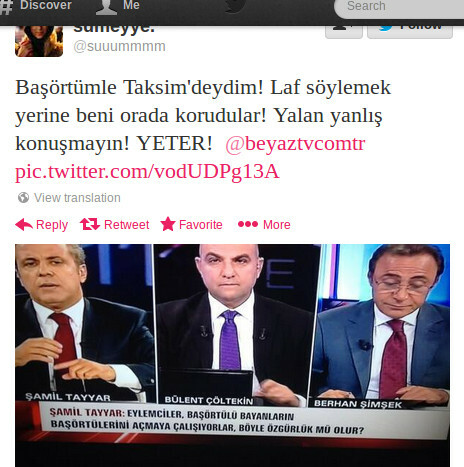 THAT IS ENOUGH!" 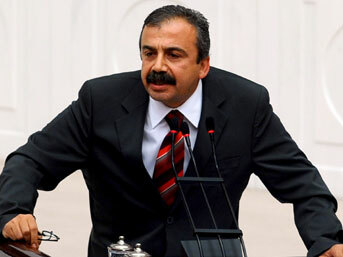 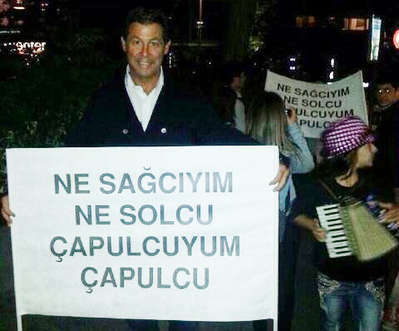 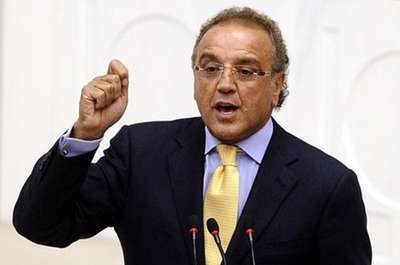 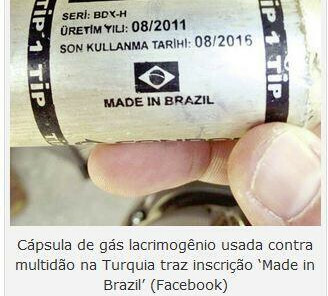 "Not of the right wing, nor the left wing, çapulcu, that is, çapulcu am I." 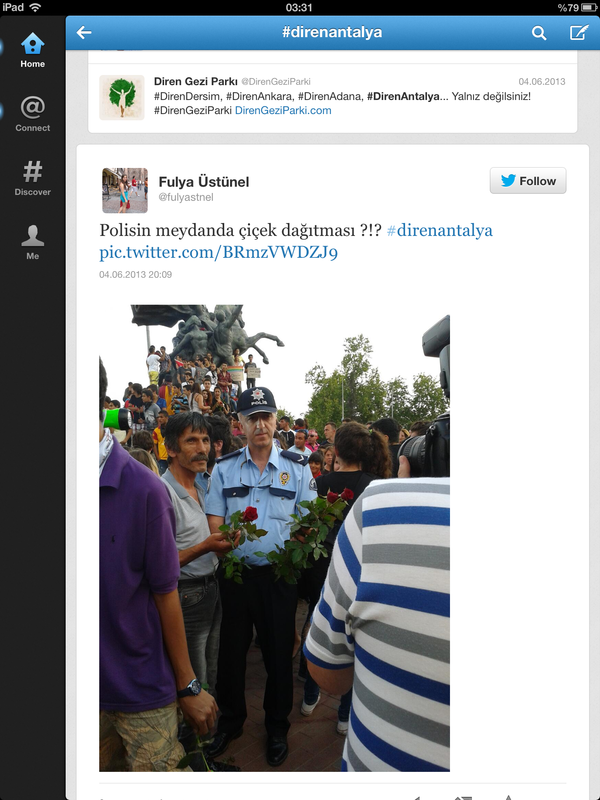 &dash; Cem Boyner, Business man"
Actress Nehir Erdoğan taking memorial photo in Taksim. 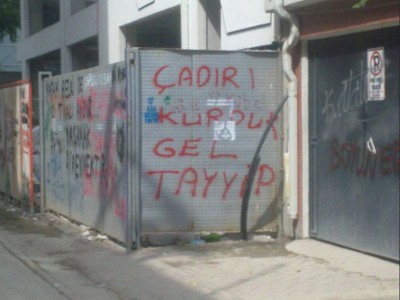 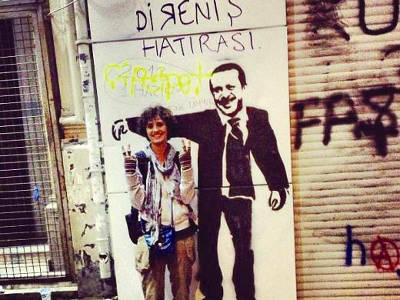 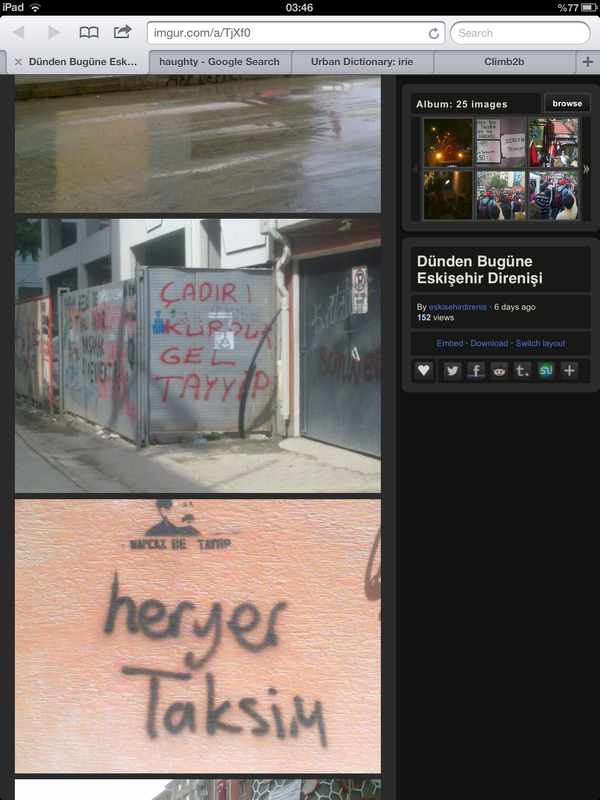 A graffiti amusing with the words in Recep Tayyip Erdoğan. 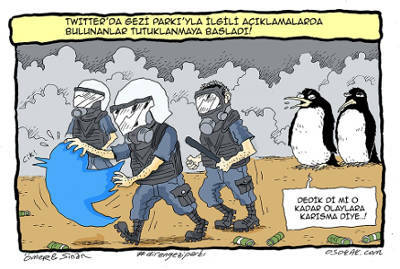 A comic joking with the Twitter custodies. 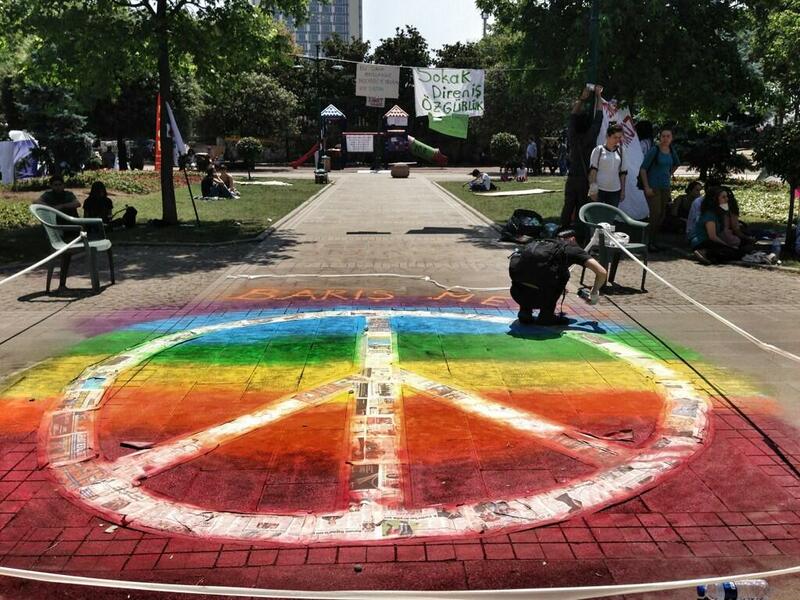 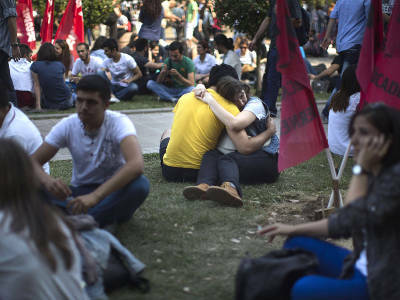 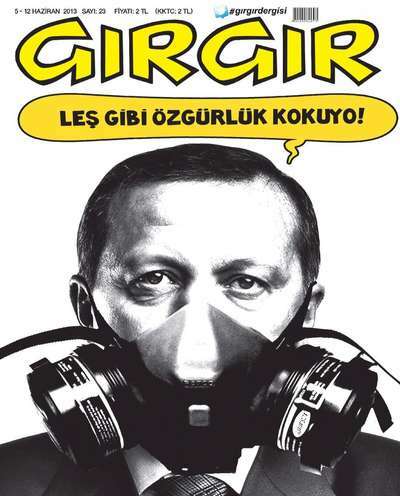 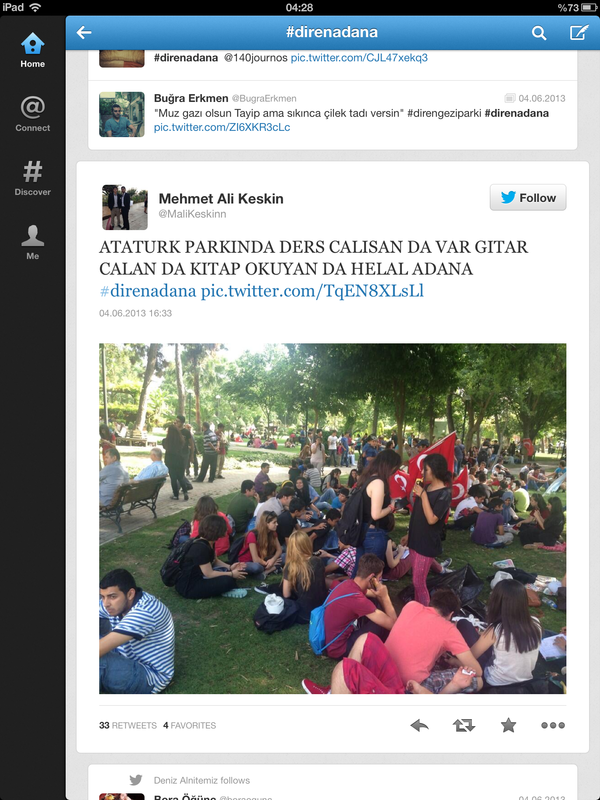 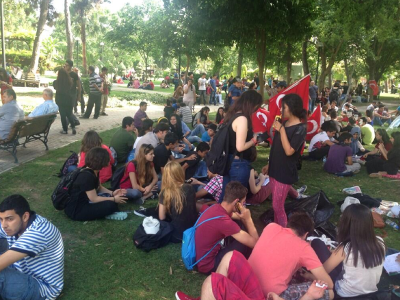 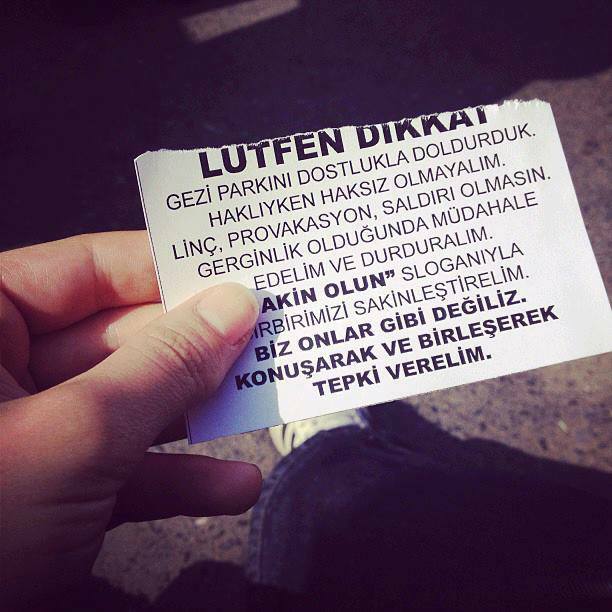 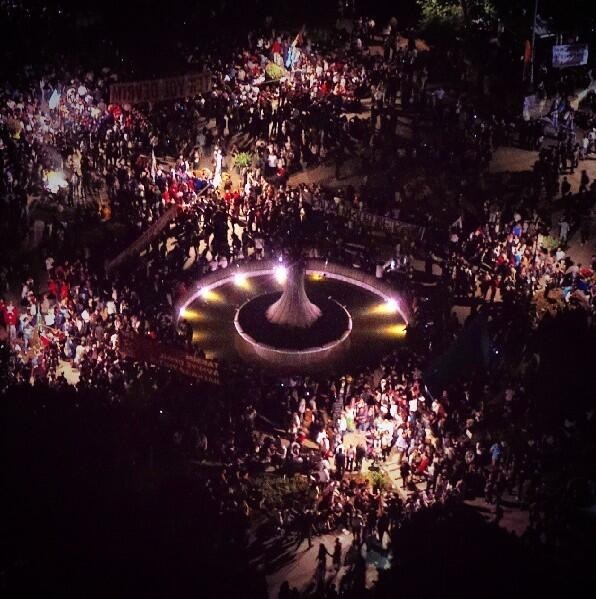 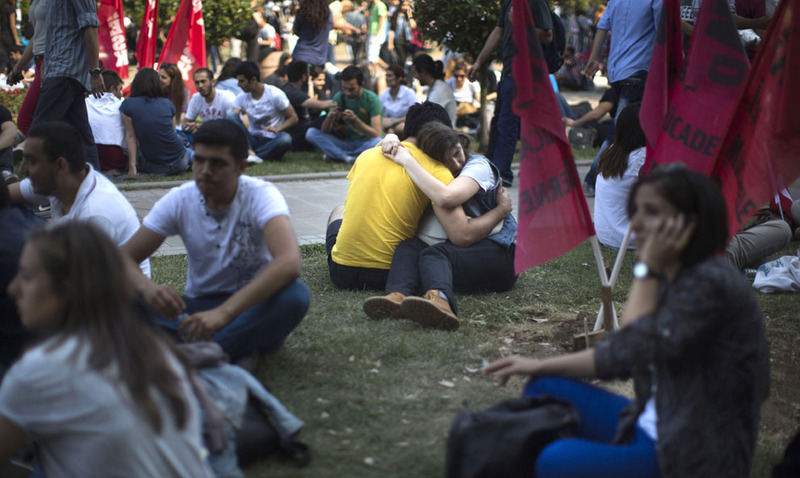 A flyer commonly handed out in Taksim Gezi Park: "We crowded Gezi Park with love. 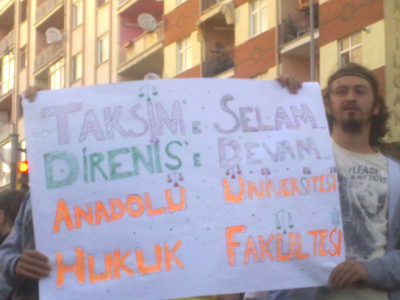 We should not fail in our fair cause. 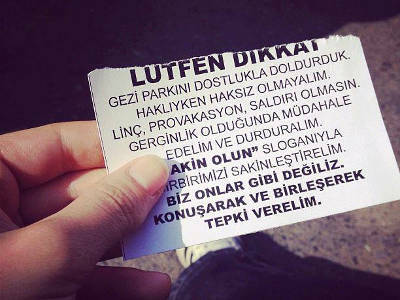 Let there not be any lynches, provocation and attacks. 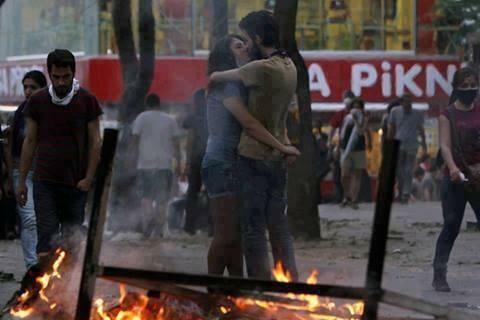 In case of need intervene and stop the tension. 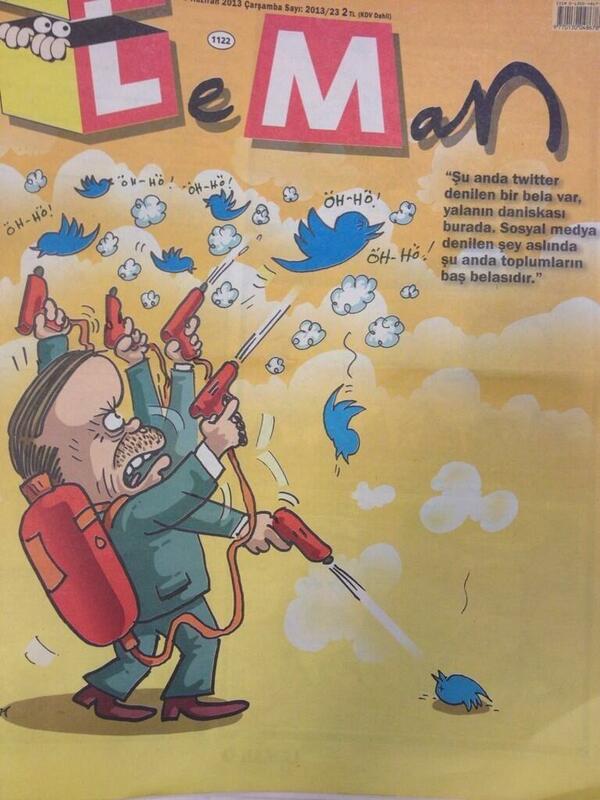 Calm down each other. 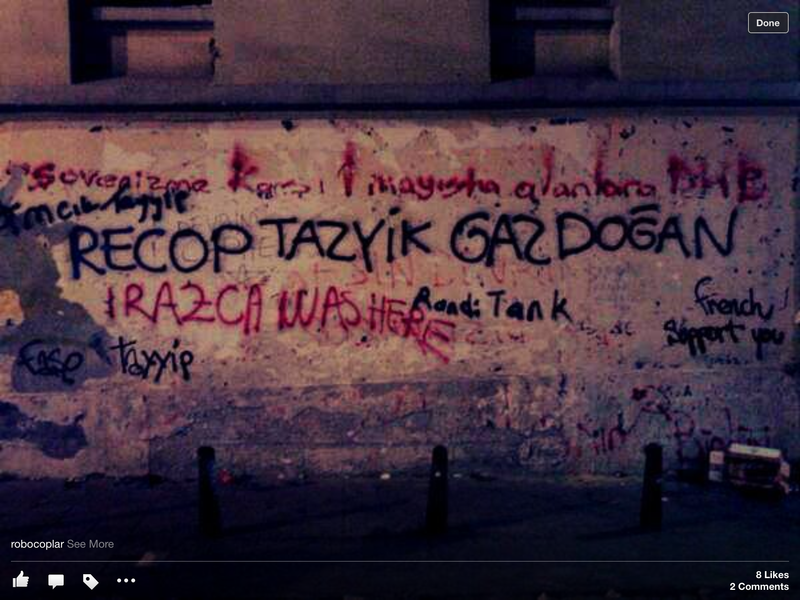 We are not like them. 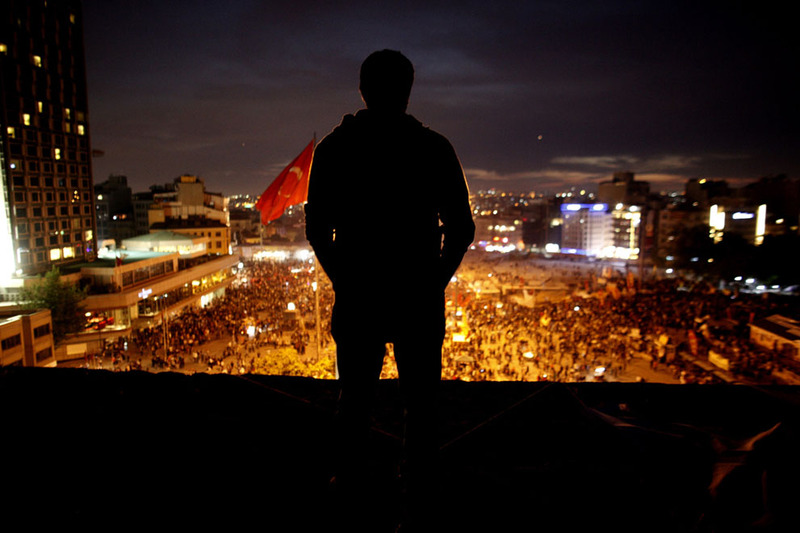 Let's show our reaction with speaking and uniting." 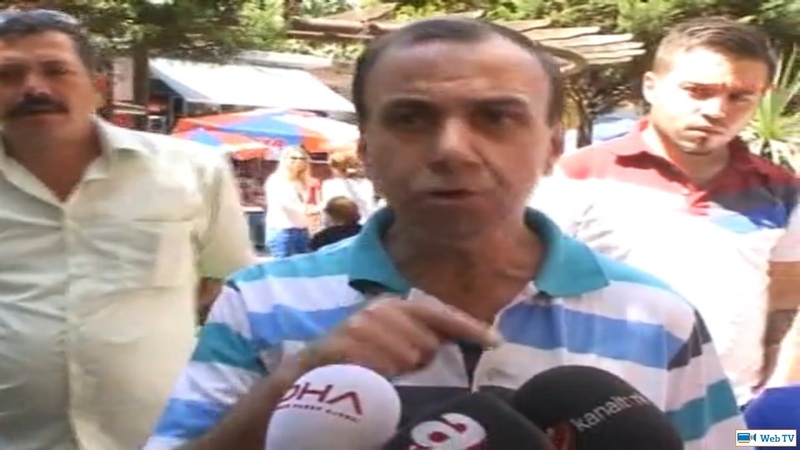 Speech of a doctor in İstanbul. Hidden camera record of protesters talking with police officers. 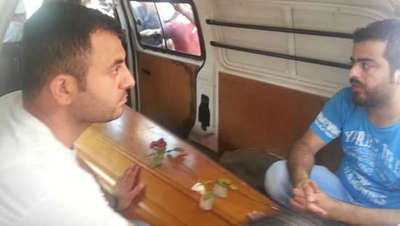 Burial case of Abdullah Cömert, Hatay, Turkey. A scene from the funeral, Uğur Mumcu Sq., Antakya, Hatay, Turkey. 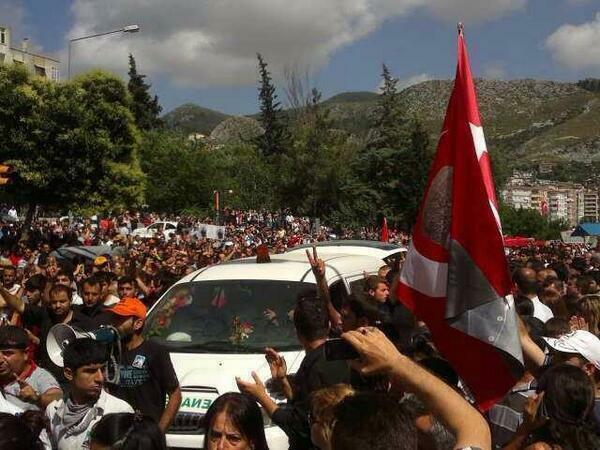 Abdullah Cömert's funeral, Antakya, Hatay, Turkey. 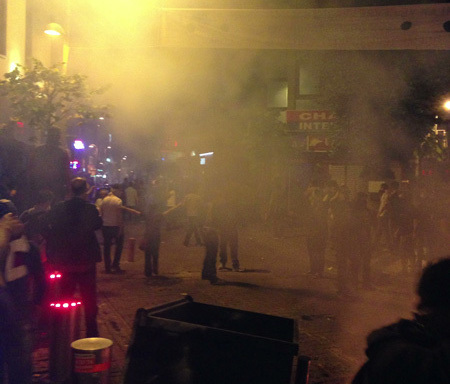 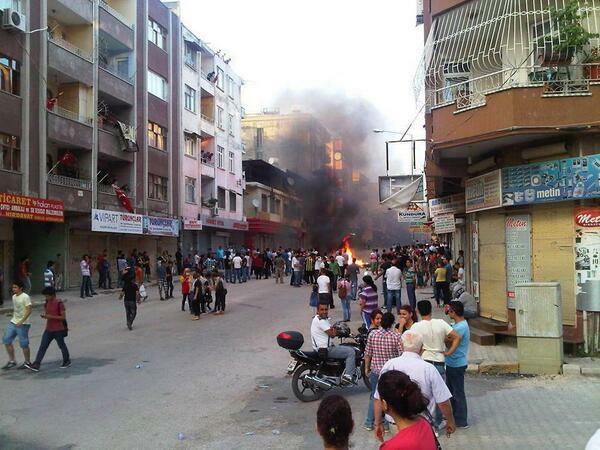 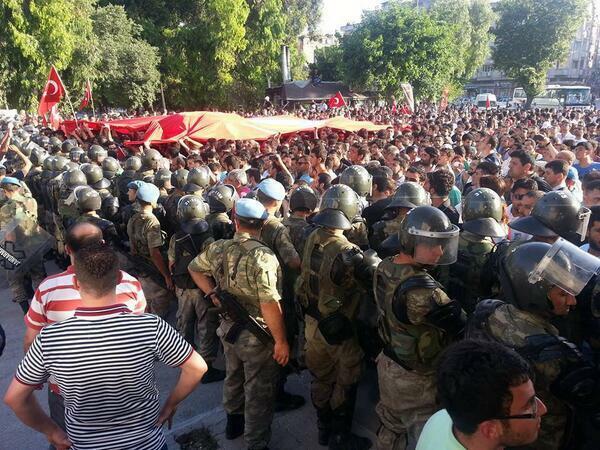 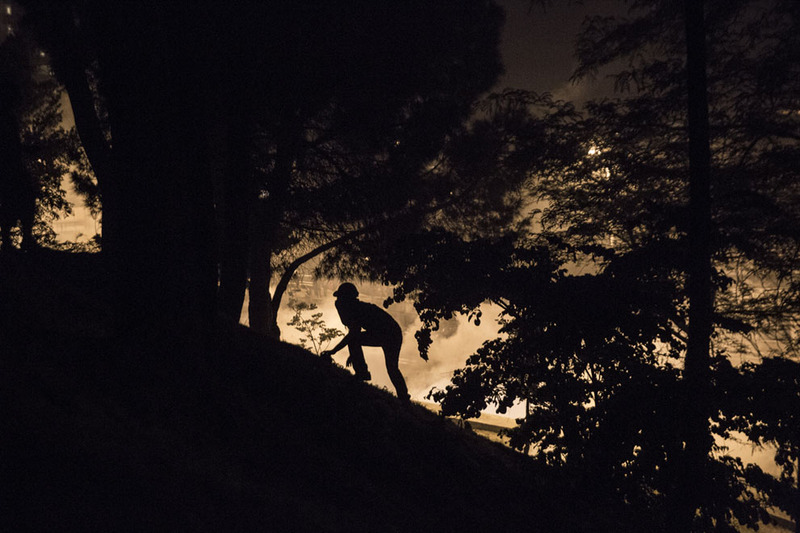 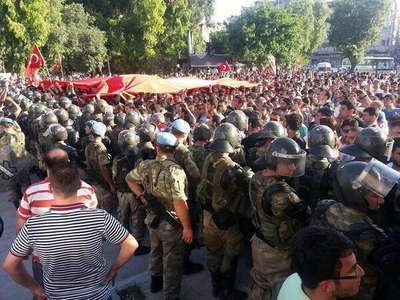 Scenes from a clash in Armutlu, Antakya. 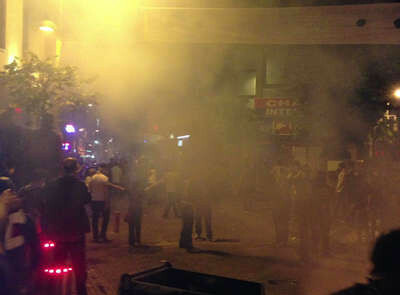 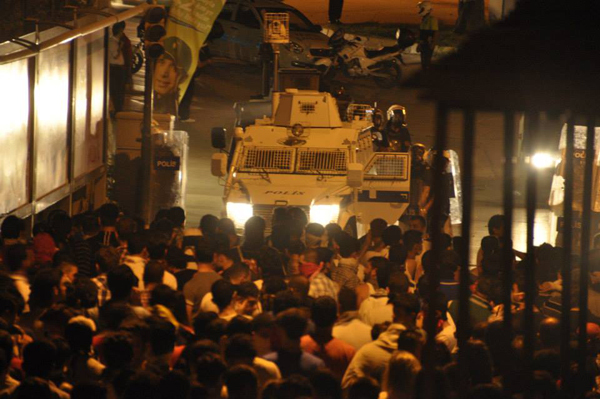 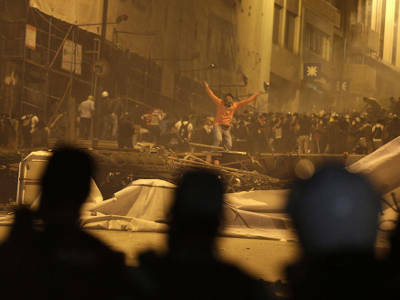 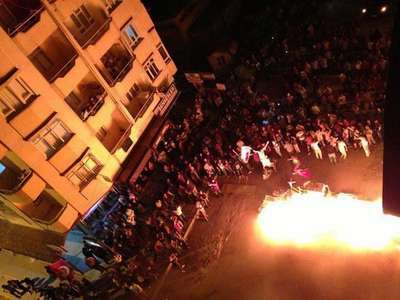 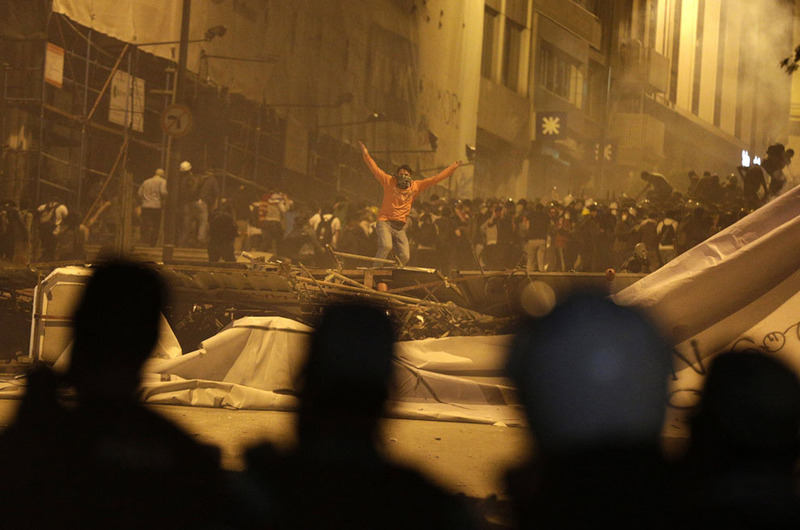 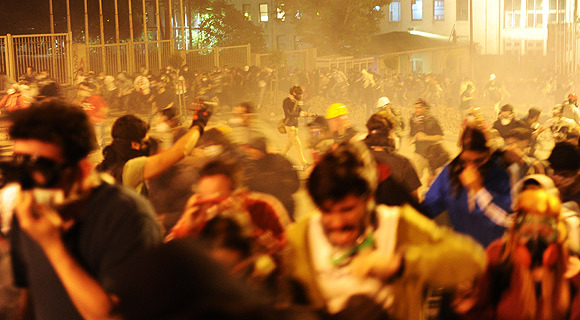 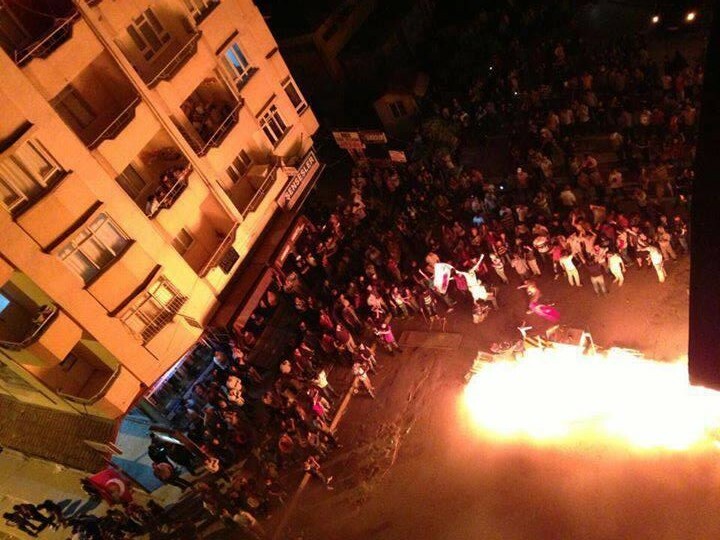 Another scene from the clashes in Antakya. 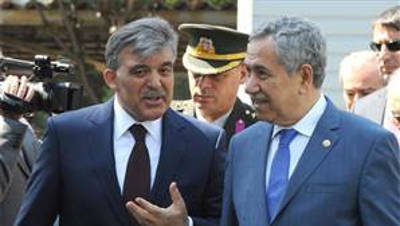 Vice Prime Minister Bülent Arınç met with President Abdullah Gül, Ankara, Turkey. 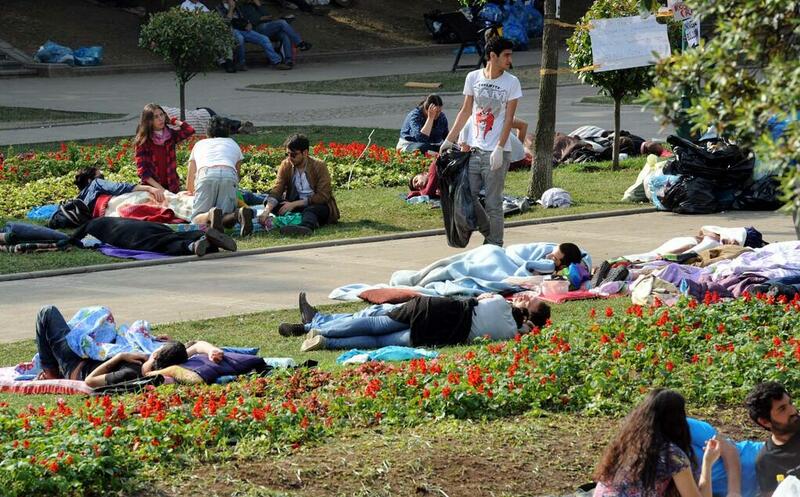 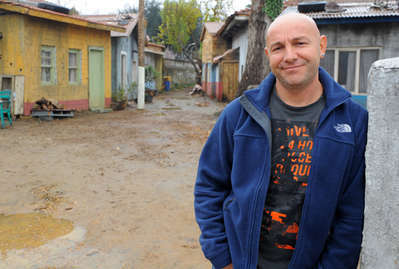 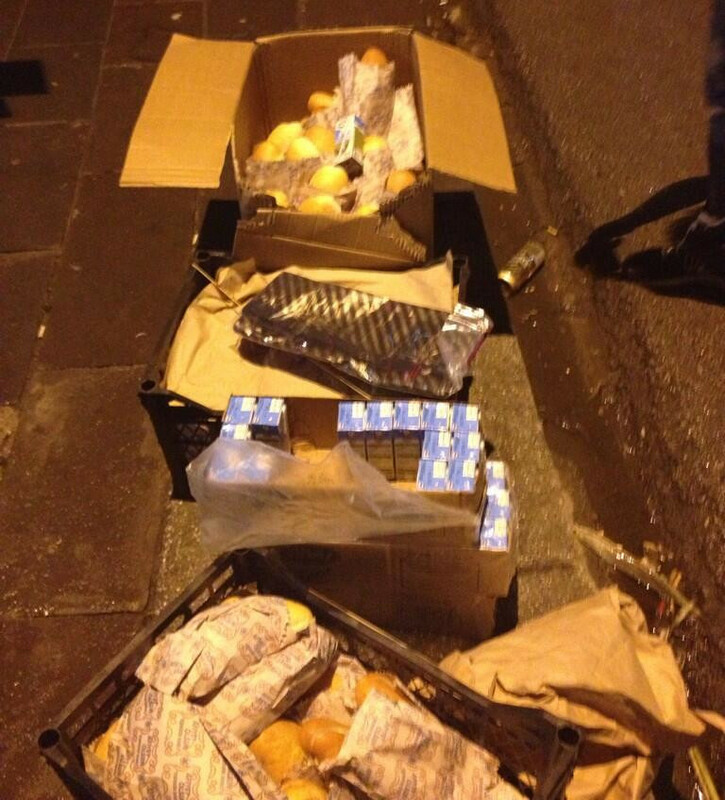 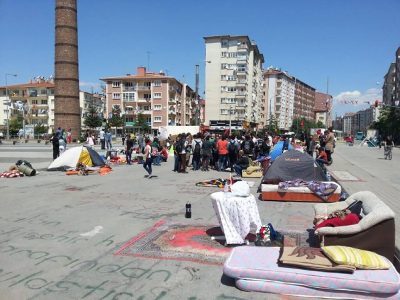 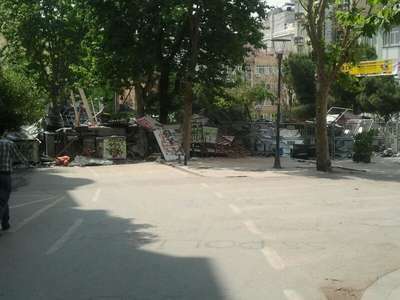 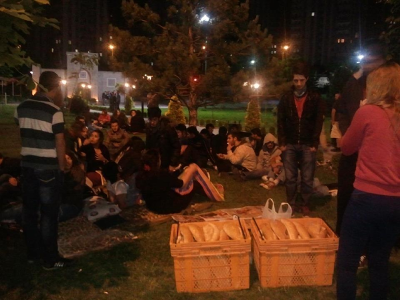 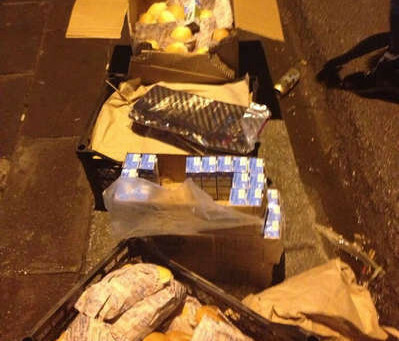 Free food resource centers built by protesters in Ankara, Turkey. 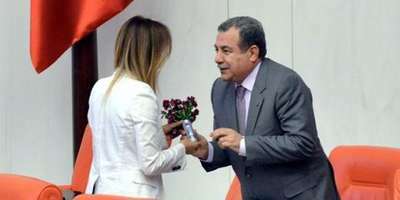 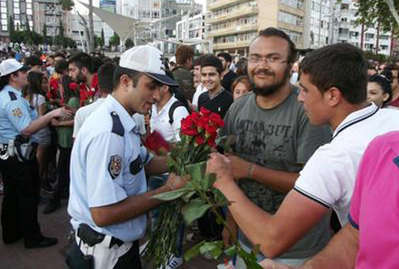 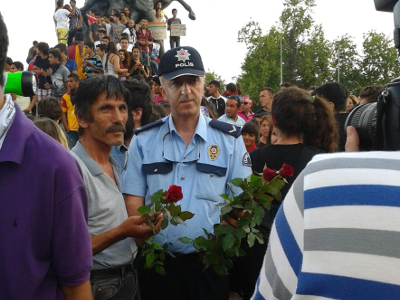 After the ongoing clashes, police officers giving away roses in Antalya, Turkey. 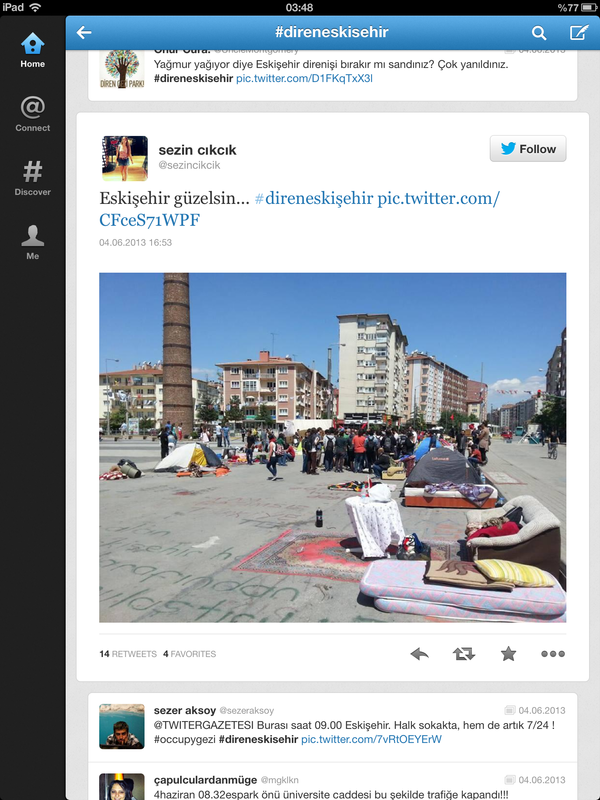 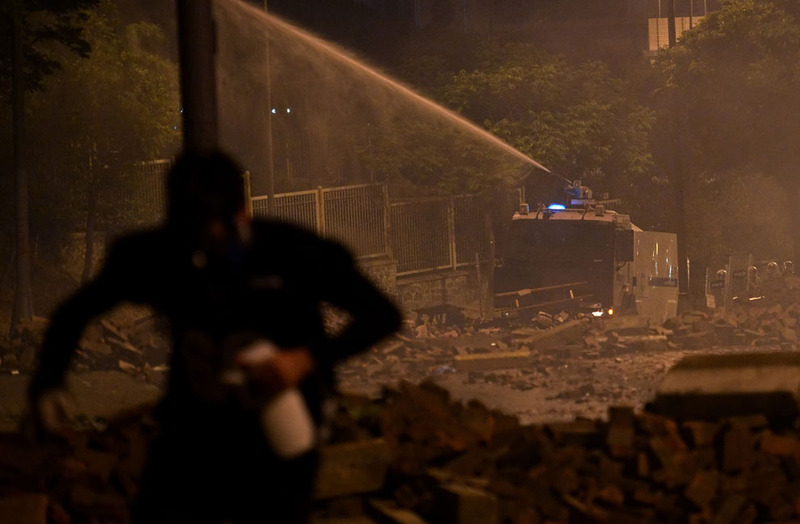 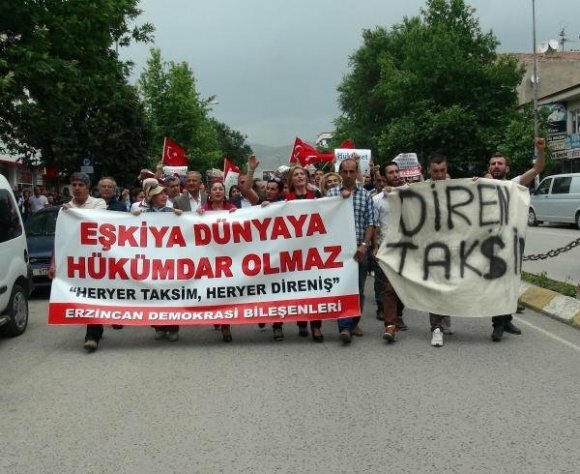 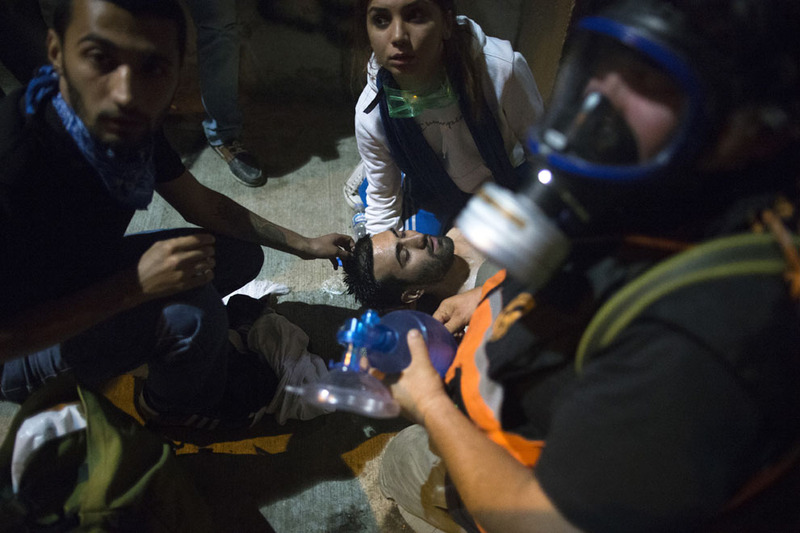 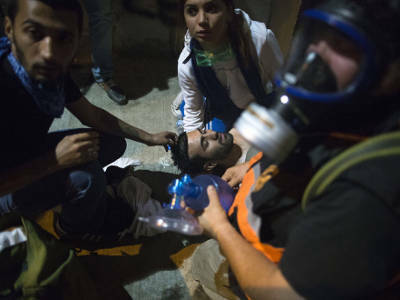 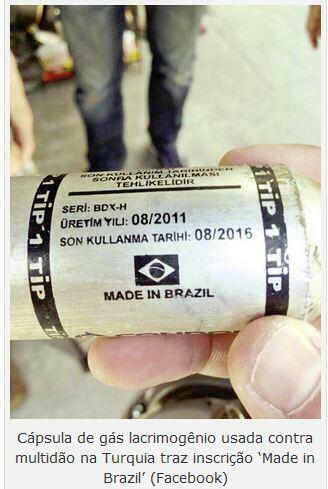 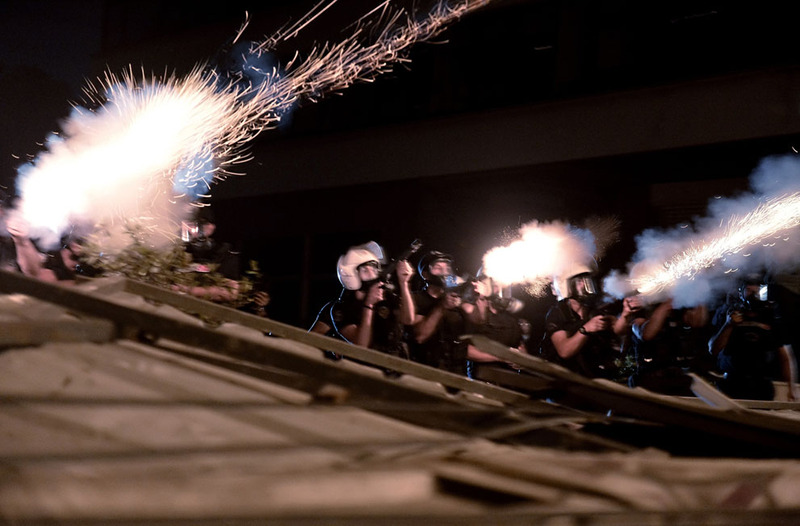 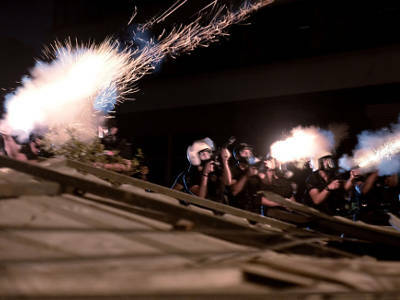 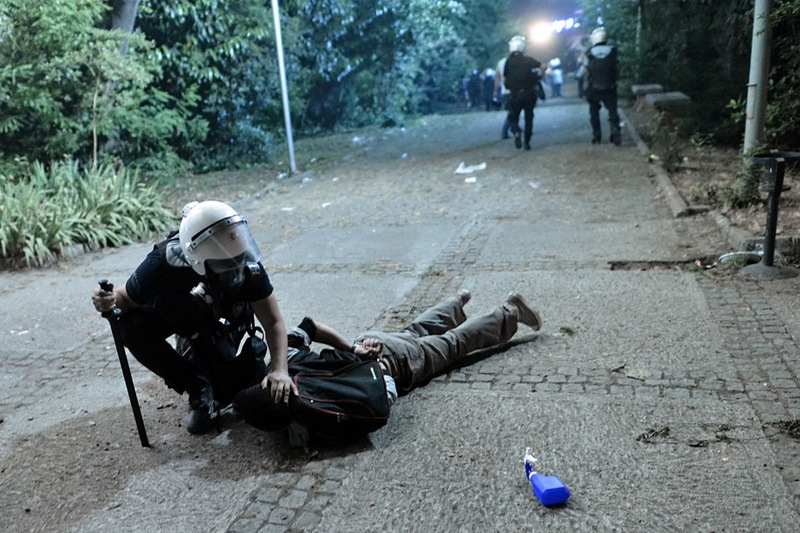 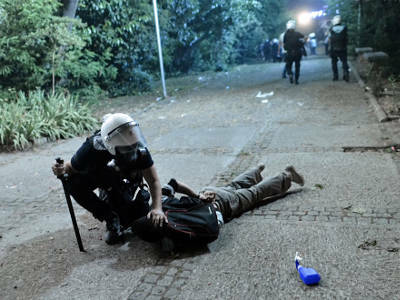 In İzmir, arrested protesters are accused of sharing scenes from this video on Twitter. 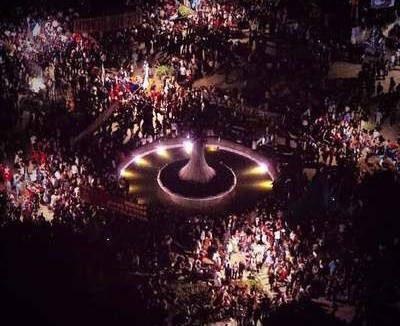 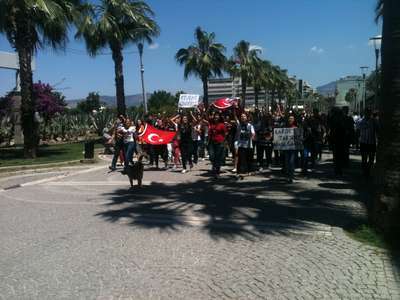 People taking memorial photos in İzmir, Turkey. 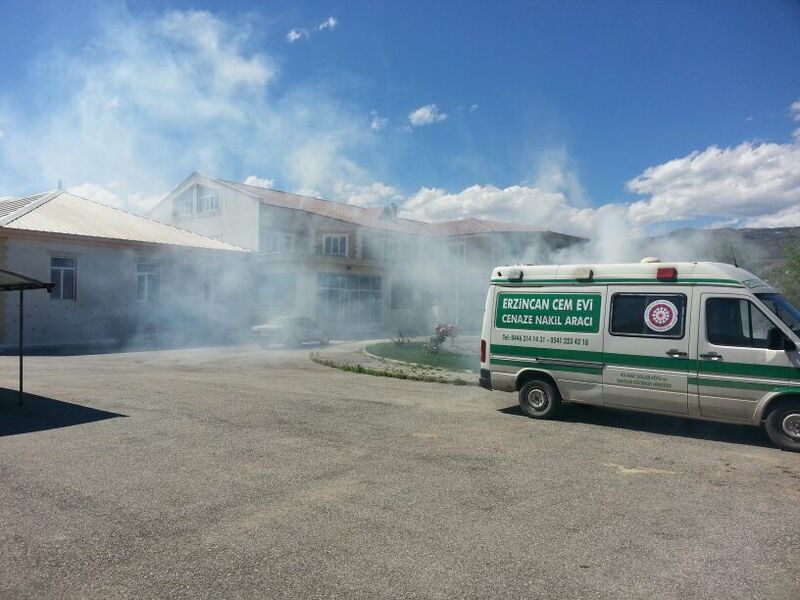 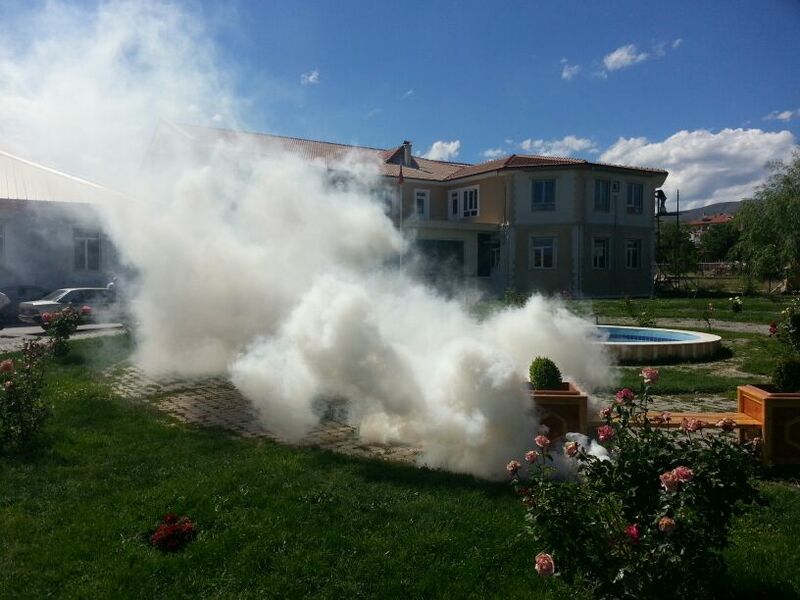 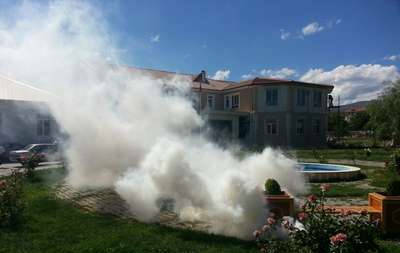 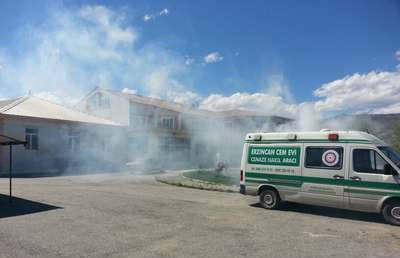 Tear gas in Cemevi [house of the religious ritual called cem and is a place of fundamental importance for Turkey's Alevi-Bektashi populations and traditions], Erzincan, Turkey. 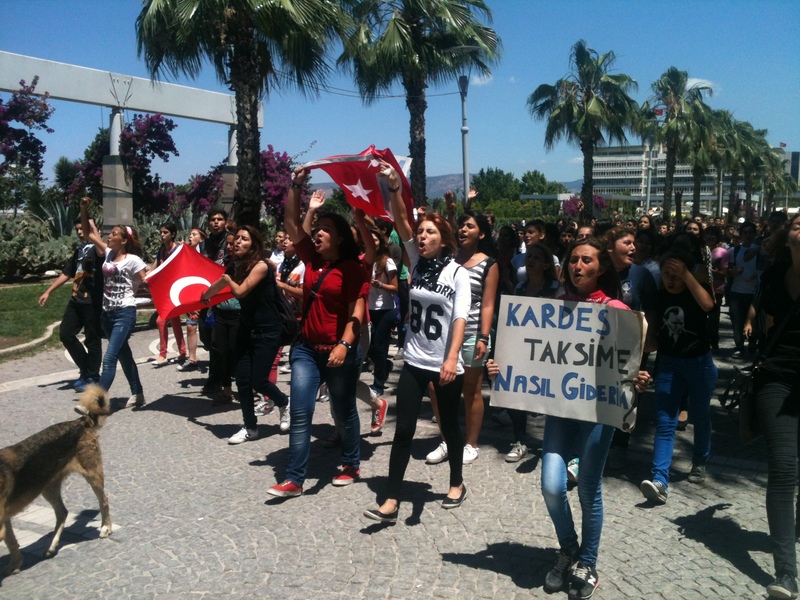 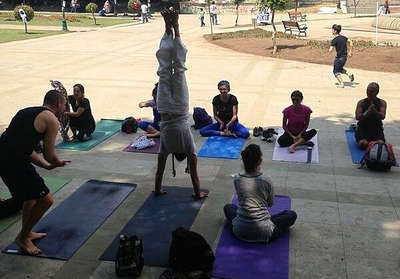 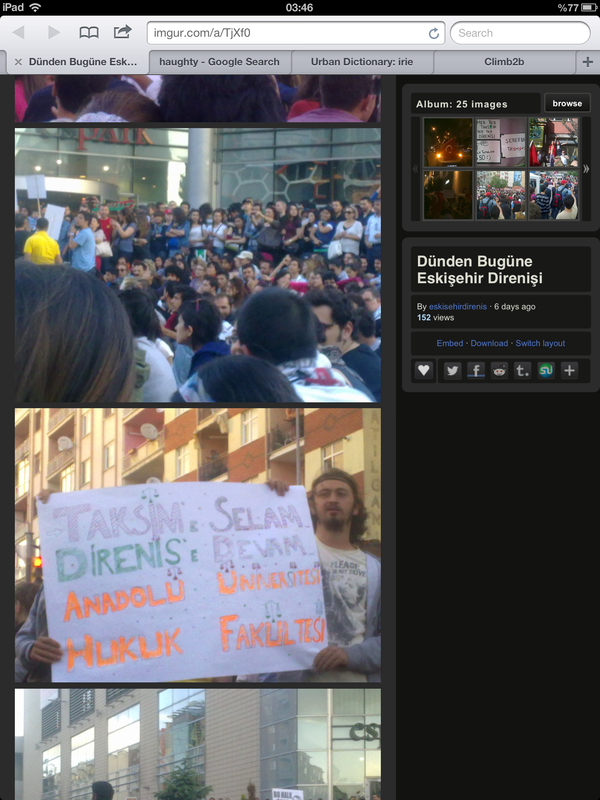 Eskişehir Anadolu University students supporting the protests.